Severe storms moved out of our area after heavy winds, flooding and hail struck the region. High temperatures in the high 80's on Tuesday combined with high humidity to fuel Tuesday's thunderstorms. "We're pretty primed," NBC10 First Alert Weather Chief Meteorologist Glenn "Hurricane" Schwartz said of the ripe storm conditions. The system brought and strong winds which reached speeds as fast as 60 miles per hour. South Jersey was hit hard by a second night of severe storms on Tuesday. NBC10’s George Spencer checked out the situation in Glassboro, NJ. The National Weather Service issued a Severe Thunderstorm Watch for the entire region warning of the dangerous weather potential. The Watch was canceled shortly after 8 p.m. however. Heavy rain in South Jersey, close to the shore as well as some areas north and west of Philadelphia still lingered late Tuesday night into Wednesday morning however. Street and creek flooding occurred in parts of South Jersey and Delaware as well as Chester and Lancaster counties. A Flood Warning is also in effect for the East Branch Brandywine Creek below Downingtown in Chester County until 8 a.m. on Wednesday. The creek is expected to rise to 7.7 feet. A Flood Advisory was also in effect for Berks, Lehigh, Monroe, Carbon and West Central Northampton Counties until 1 a.m. 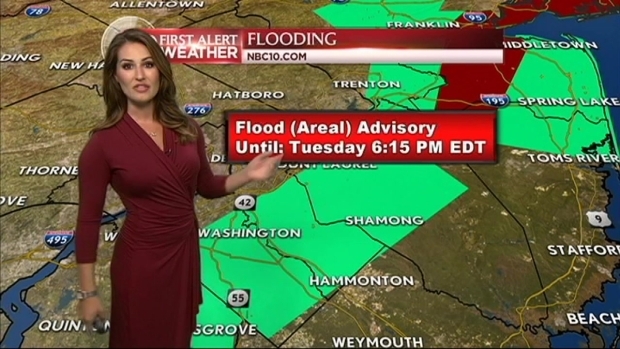 Finally, a Flash Flood Watch continues for Delaware and South Jersey until 6 a.m. on Wednesday. The storms hit Burlington, Mercer and Ocean Counties around 3 p.m. and moved into Delaware around 3:30 p.m. In Mercer County a lightning strike hit a power line on Whitehourse Mercerville and Klockner Roads, starting a small fire. In Glassboro, Gloucester County, strong winds toppled trees and even caused small fires. 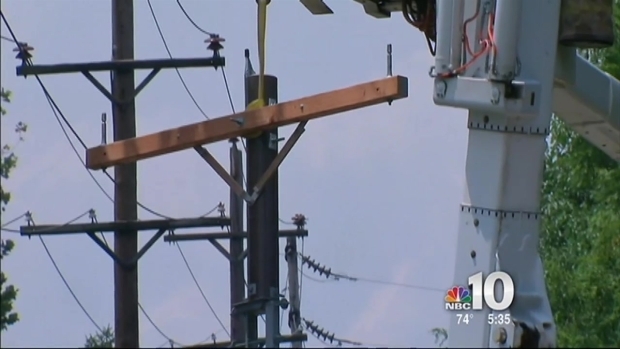 Citizens in Levittown are dealing with the damage caused by they thunderstorms. NBC10's Rosemary Connors has the details. "Never seen it that bad before in my life," said Elaine Brigandi, a longtime Glassboro resident who witnessed a tree fall in her neighbor's yard. "I could hear the crack. I saw it coming toward the house and you're kind of like in shock in a way." In neighboring Washington Township, crews responded to three small fires sparked by lightning. "Some electrical damage to the homes in each particular case but no serious fires," said Washington Township Fire Chief John Hoffman. 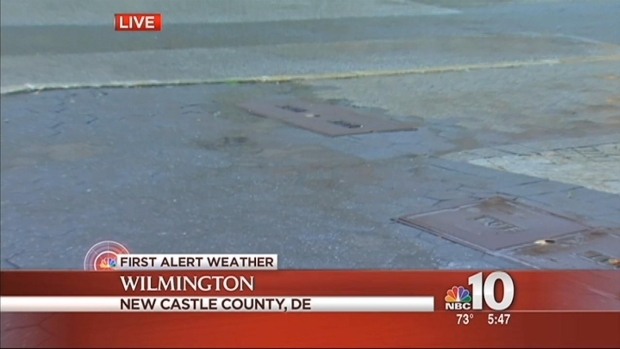 The severe weather also hit Wilmington, Delaware hard. NBC10's Christine Maddela. Despite the damage, power outages in the Glassboro area were not widespread. 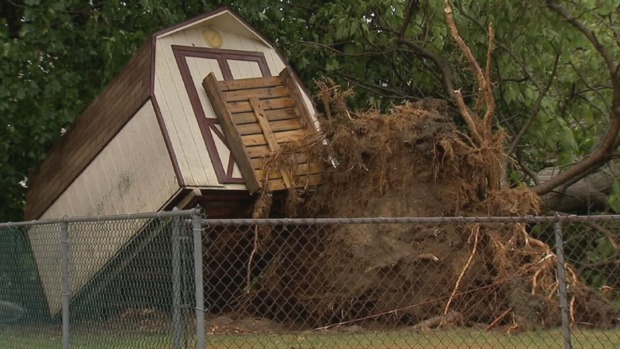 In Pennsylvania, storms moved into the Philadelphia area late Tuesday afternoon. The violent wind caused a tree to fall on a car on the 5900 block of Palmetto Street in the Lawncrest section of the city. In North Philadelphia, another tree fell on the 4700 block of North Mascher Street. There were also reports of downed trees on Roosevelt Boulevard between Cottman Avenue and Ryan Avenue. No one was hurt during any of the incidents. 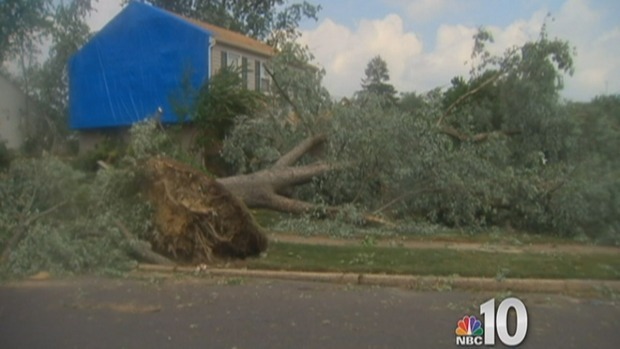 Residents in Voorhees, New Jersey are dealing with the recent thunderstorms and the damage it caused. NBC10's Cydney Long has the details. The storms caused power outages though they were nowhere near as widespread as they were on Monday. As of 11 p.m., PECO reported 1300 outages, with around 900 in Philadelphia. AC Electric reported 182 outages, mostly in Glassboro in Tabernacle. PSE&G has around 40 outages, mostly in Mercer and Camden Counties. The storms cleared the area by midnight though there were some leftover showers overnight into Wednesday morning. Much drier air will move in and humidity will drop dramatically Wednesday afternoon. The nice weather will continue Thursday and Friday with unseasonably low humidity. More clouds will then move in over the weekend with the chance of more storms on Sunday. The NBC10 First Alert Weather team is tracking the weather pattern and updated information will be posted here.